It’s that time of year again and depending on your popularity and age, you may have reached a point when one wedding blends into another. Increasingly, brides are looking for ways to make their weddings stand out from the crowd. Not only that, but today, many couples have complex lineage and are keen to introduce aspects of a traditional wedding ceremony or reception from their cultural backgrounds. It might be by entertaining your guests with a fire-eater or giving them a candy buffet, but if you are looking for a little cultural inspiration, here are just a few examples of some of the wonderful ways people celebrate their nuptials in other countries. 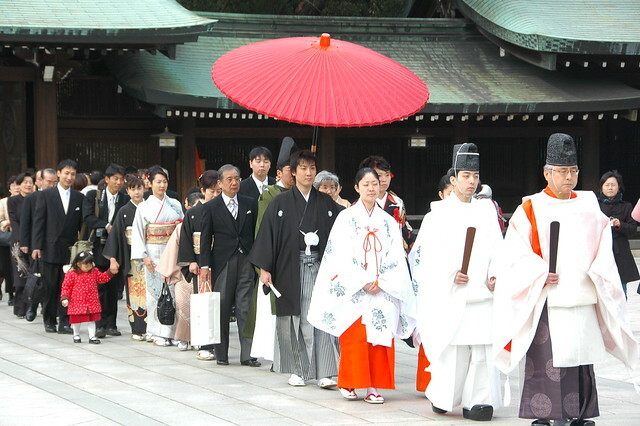 In true Japanese style, a traditional Shinto wedding ceremony is wonderfully elaborate and breaming with tradition. San-san-kudo, otherwise known as the sharing of sake is still a crucial ritual that is performed today. The groom will take three sips of sake from three varying sake cups. Following this, the bride will follow the same suit. The sake is then offered to the groom and brides families. According to Japanese legend, cranes are thought to live a long life. In many Japanese weddings, the couple incorporate the tradition of folding 1,000 origami cranes (sembazuru). It is thought that the time and energy they must put into doing this symbolises the patience and trust necessary to fulfil a long and happy marriage. They are also given as wedding gifts. The colour red features heavily in Chinese weddings as the colour symbolises love, joy and prosperity. The tea ceremony is integral to the wedding celebrations: as a mark of respect to honour their elders, the bride and groom offer them cups of tea. 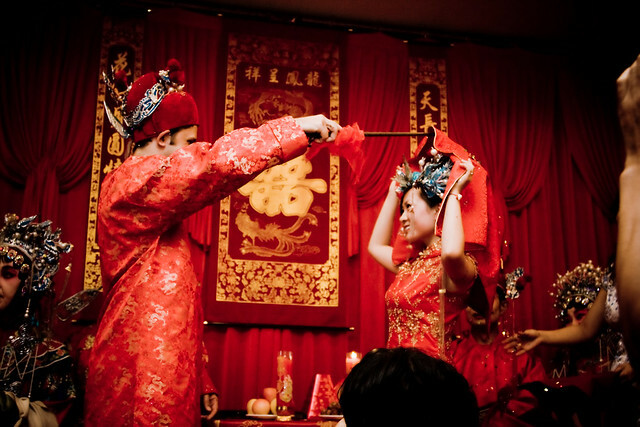 A traditional Chinese wedding will also include a 10-course banquet to celebrate the day. It is becoming increasingly common in India to get married with others. That’s not to say couples take part in a double marriage, rather a mass marriage. A famous Indian actress, Navneet Kaur married this year at such a ceremony with 3,611 other couples. Community marriages such as this are seen increasingly in a positive light, reducing the need for unnecessary personal expenditure and counteracting problems with the dowry system. Traditionally, before the ceremony, the bride and groom would sit under a canopy of green branches to symbolise their unspoilt love and receive good wishes from their guests. It is not uncommon for modern couples to have a branch near them at the reception. This will ultimately hold paper leaves on which guests have written their good wishes for the couple, akin to a western guest book. 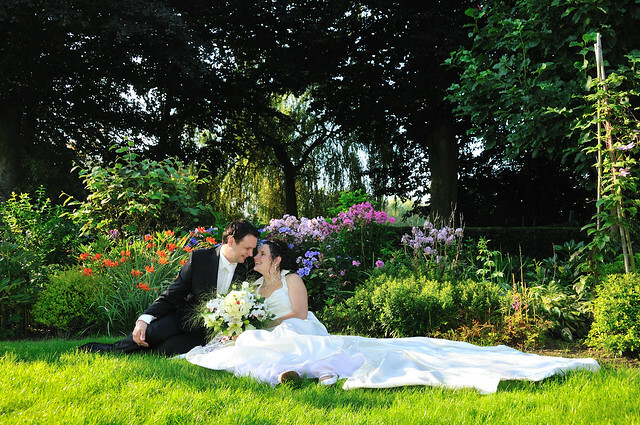 Another tradition is for the bride and groom to plant a lily-of-the-valley on their wedding day – as the flower blooms each year, the couple will be reminded to renew their love. The French tradition is for the groom to go to the bride’s house on the morning of their wedding to collect her and walk her to the church. In smaller towns, children tie which ribbons across the road, which the bride must cut to demonstrate her ability to break through these obstacles. Just before the ceremony, the groom walks his mother down the aisle. 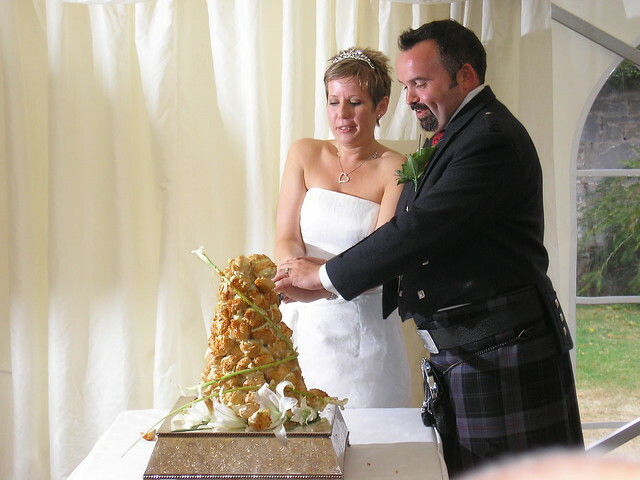 At the reception, instead of a cake, a croquembouche is traditional. This is a high cone of pastry-cream-filled choux which is decorated and covered in caramel. It is thought to take its inspiration from medieval times when guests would bring cakes and pile them high. If the bride and groom could kiss over the top of them, they would go on to have a prosperous life. This article was produced by Ingle and Rhode – London based jewellery specialists of bespoke wedding rings and engagement rings.